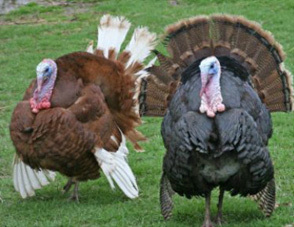 We have an extensive range of turkeys available and supply to farmers nationwide in both large and small quantities. We regularly supply over 60,000 turkeys every year for the Christmas market and start our day old deliveries as early as June. Individual orders can range from as few as 6 birds right up to commercial flocks of several thousand. Both white and bronze turkeys are available as day olds or as “off heat” growers. We pride ourselves on our friendly and helpful approach. Most of our customers have been with us for many, many years and word of mouth recommendations introduce more people to us every year. Indeed, some of our customers have been having their turkey stock from us for 40 years! We believe that our existing customers are our best form of advertising. Our annual turkey price list is posted out in good time and includes a planning calendar and useful weight guide to help you to organise your rearing programme. Please feel free to call us at any time to discuss your Christmas turkey requirements or to request a price list.